That’s what horseman Randy Rieman once told me. And I thought I could hang out in comfort, where my horse and I would coexist blissfully and enjoy a lifetime of happy riding. Turns out, it ain’t so. Turns out, we must experience some discomfort in order to appreciate comfort. Comfort is a place, a situation, a feel where nothing bad ever happens. Comfort can be a protected environment or a state of mind. We can all be guilty of keeping our horses in that perpetual comfort circle, where nothing is allowed to rile them. But, according to many interviewed clinicians, women are especially prone to it. We tend to be nurturers by nature. The warm and fuzzies are what we have to offer our friends, our children, our animals. We often respond to big horsey challenges with fear and its cousin, a lack of confidence. Staying in comfort is one way to avoid these negative emotions. Comfort, like comfort food, isn’t always good for you. Give your horses too much of it, and they will be worse off. Dr. Steve Peters and Martin Black presented a powerful, science-supported argument for this idea at the Evidence-Based Horsemanship seminar recently at Parker Stables in Sherwood, Oregon. Comfort has its neurological home in the autonomic nervous system. Read more. This brain feature is responsible for parasympathetic (“rest & digest”) and sympathetic (“fight or flight”) responses as well as homeostasis, the system’s ability to maintain internal stability. That’s the closest scientific term for what we call comfort. If you think of homeostasis in terms of temperature, it’d be that office-friendly, 70 degrees. The hypothalamus, part of the brain located under the thalamus in all mammals, is the modulator or thermostat for homeostasis. In the Evidence Based Horsemanship diagram (at right), Peters and Black describe the ideal learning environment as one that takes the horse to a state just outside its comfort range. Ideally, when that moment of learning (and discomfort) is over, the horse will automatically return to its homeostasis and there will be a rush of dopamine (one of the brain’s feel-good neurochemicals). It’s the rainbow after the storm. Read about trailer-loading and dopamine. Horses, like all mammals, crave dopamine. But they don’t get it without feeling stressed first. “If you never get a horse out of his comfort zone, he’s never going to seek comfort. 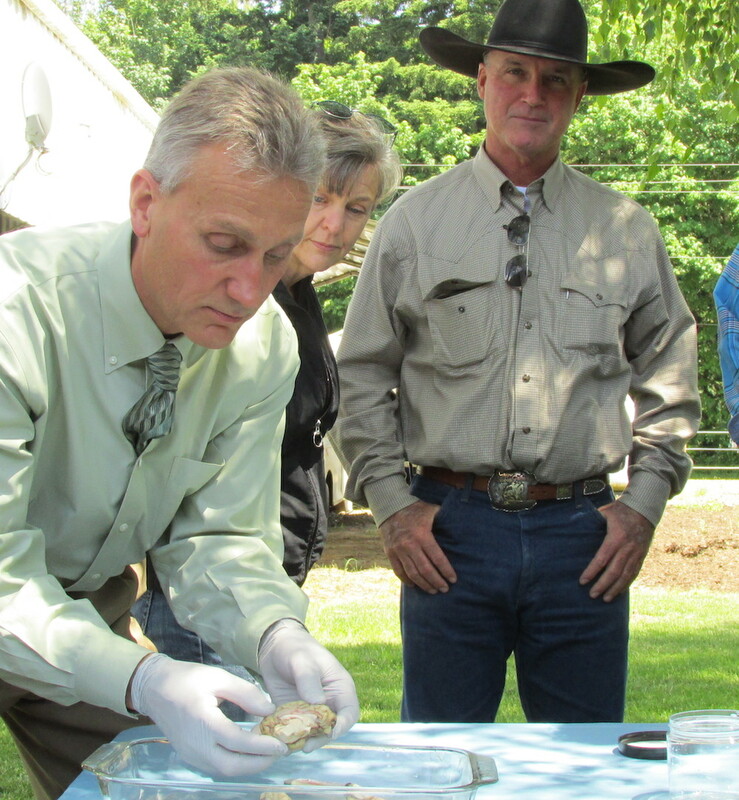 I help riders learn how to find that dopamine release with their horses,” said Black. Turns out our homeostasis range or comfort zone can expand or shrink depending on our exposure to different situations and settings and how we manage there. Read more about Optimal Learning. It’s up to us humans to overcome whatever issues we have with our own comfort and discomfort, in order to do what’s best for our horses. “Fear is a big thing that just owns some people. It can be overwhelming,” he said. Brannaman implores his students to work with their horses at full speed and to learn how to use flexion and the one-rein stop. Read more about bolting and rider fear here. Nice to see someone addressing the fear angle in horses. I used to spook my horses till they quit reacting to the spook. Be it an umbrella, water, balloon, etc. Have had some people nag me about how “mean” I was because of what I did. Know what. My horses were practically spook proof. On occasion they would become alert, but did not bolt, shy away or run. I always had a great ride. If you don’t push their envelope, they’ll never learn. If you push their envelope so far that it tears, you’ll never be able to glue it perfectly back together again. Or, the learning process always involves some degree of stress. the teacher’s job is to NOT exceed the stress threshold. Shaking my head in disbelief! It is common knowledge that stress hormones inhibit cognition. What will the roundpenners think up next to make a buck???? How about a magic round pen that dispels fear stimuli in the Amygdala? Thanks for your comment and links, Chuck. Based on the links you provided, I think we agree more than you realize. For instance, we are not advocating training through fear or increasing the level of cortisol or engaging the amygdala hyperactively. Of course, panicked animals (humans included) cannot think. But animals that are never asked to leave their homeostasis or comfort zone don’t make progress. You’re mixing things up, Chuck. There’s a huge difference between round-penning a horse thus sending his cortisol level flying and taking him just shy of their comfort zone. Learning never happens when you don’t dip your foot in the water. Is there any evidence (beyond a Buck anecdote) to support the graphic? Does this assume training by negative reinforcement only? Thanks for your question, Patricia. 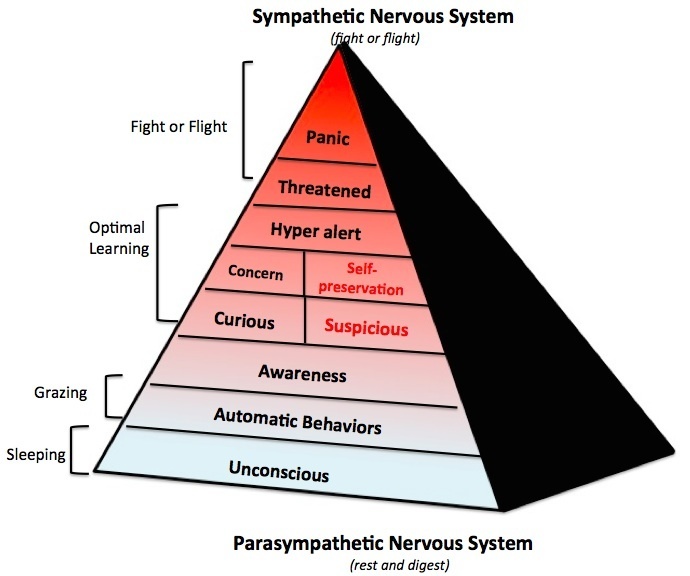 The graphic I think you refer to is an extrapolation/illustration of elements of the autonomic nervous system. The parasympathetic (“rest and digest”) and the sympathetic (fight or flight). The autonomic nervous system is widely taught in college biology classes, for instance. Does this help? It shows an area labeled “Optimal Learning”. What is the evidence to designate it as such? The Buck thing isn’t an anecdote. 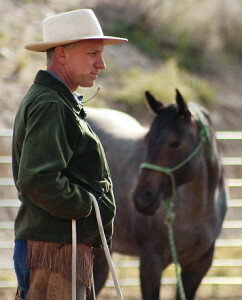 Dialing horses up and down is something he advocates on a general basis. 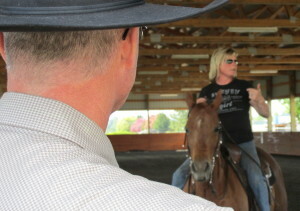 His point is to get horses emotionally fit so that they don’t freak out every time you ask for more action. Let’s be honest: as a trail rider, I know LOTS of people who daren’t gallop their horses because they can’t calm them down for an hour after that. I think that quoting BB here is somewhat confusing since the article is mainly about something very different: taking horses just outside their comfort zone so that learning takes place. 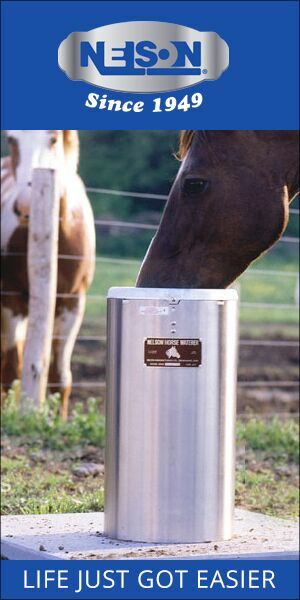 What Buck says is that horses should be able to easily move from one level of energy to another.